The "Porsche auf Sylt" lounge is less of a sales outlet and more of an introduction to the brand. SYLT, Germany -- Porsche's Germany CEO, Jens Puttfarcken, feels at home in Sylt as he surveys the latest wave of tourists arriving from the mainland. After all, whether you own a Porsche or work for the luxury automaker as he does, you belong to an extended family. From atop the roof of Porsche's new retail outlet on this wealthy vacation island off the northwest German coast, Puttfarcken can pick out the customers he expects to see at store's official opening. Spotting a car in the line with the characteristic sloping silhouette of his company's most famous coupe, he gestures. "See that? Another 911," Puttfarcken says with the satisfaction of a salesman who knows that if he wanted, he could probably spend all day counting Porsches on the island. As the long line of vehicles creeps slowly along, the first building they file past in the resort town of Westerland on their way to chic hotels or vacation homes is Puttfarcken's "Porsche auf Sylt," an experimental retail format. It's not a traditional dealership and whether it's really a store is up for discussion. Sure, sales leads can be generated for nearby "Porsche Center" dealerships and people can buy Porsche-themed key chains, stylish jackets or designer luggage. If someone really asks for one, they can get brochures and price lists tucked away discreetly in shelves, but that's not the point. It doesn't have any of the normal markers of corporate identity, either. The lack of Porsche logos mean no one could mistake it for a Porsche Center and even the lettering type of the name on the building is different. Were it not for one dead giveaway, a classic 1970s Carrera RS prominently displayed in the window, there would be no obvious reason for people passing by to necessarily connect it to the sports car brand. Porsche hopes to win new fans to the brand but the location is more about helping people to feel at ease with a marque associated with wealth and status. Sales managers say some customers entering a dealership have to overcome initial psychological hurdles such as "Do I belong here? Can I even afford a Porsche?" Not all associations with the brand are also positive: owners can be considered elitist, even chauvinistic and their cars a polluting decadence. With the new store, Porsche wants to be in the middle of people and show that everyone is welcome. Whether you wear tattered jeans, have long dreadlocks or tattoos all over doesn't matter, managers say. There is even a water bowl for dogs. Inviting people for a cappuccino to remind them subtly of the brand's accomplishments, technological innovations and heritage and its place in history and society through a location such as "Porsche auf Sylt" is a clever way of ensuring that acceptance. Other German premium carmakers have already taken similar strides, hoping to make their brands both desirable and approachable. The idea of new retail formats is nothing new, Puttfarcken admits, putting a positive spin by calling the brand "an early adopter" with the approach. But instead of following its peers by setting up flagship brand lounges on the high streets of Berlin, Hamburg or Munich, Porsche Germany wanted an entirely unique experience and Sylt fitted perfectly. The number of affluent tourists at the resort mean that you are more likely to spot a premium car than a mainstream model such as a Volkswagen Golf. "Here our Cayenne SUV is called the Island Golf," Puttfarcken says. Most vacationers are on the island for a week at least, plenty of time to see everything Sylt has to offer, including the new Porsche lounge. It has the perfect ambience for casual, no-pressure interaction with the brand. But due to the inhabitants' desire to keep the island's small fishing town flair, permits for new developments are non-existent. Porsche waited until a local outlet store on the main axis road closed before snapping up the land, razing the building and starting afresh. Running the new operation is Mirko Riekers, whose friendly demeanor and genuine enthusiasm belies a time at Mont Blanc where one of his various responsibilities included rejecting repeated requests from corporations that wanted their logos emblazoned on the exclusive pens. Riekers hails from Hamburg and he says his northern German roots were a prerequisite for the format. Even if the island welcomes hundreds of thousands of tourists each year, the lounge itself should appear as if it was homegrown. Swabian accents from Porsche's home town of Stuttgart in southern Germany would be seen as out of place in Sylt, located on the northern most point of Germany jutting into Danish waters. Inside the store is a virtual reality demonstration table, where visitors can use a HTC Vive headset and play around with colors or interior trim of a Porsche look at the body-in-white, learn more about the hybrid electrification or watch the airflow around the car change when a spoiler is retracted. Puttfarcken had first seen it early this year at an internal Porsche event in South Korea, and immediately arranged to get it. The interior is supposed to be organic and inviting, with warm blues and sandy hues to evoke the sea, but it still has an austere modernity to it that might stop many people from crossing its doors. It's not an Apple Store with a Porsche parked inside, but more like the inside of a 1 percenter's home. "We had customers say it looks just like their place," Riekers said. Despite assurances from Porsche that they would love to see children spend time in the location, it's hard to imagine kids running around the location playing tag, or dogs taking a break on the shaggy rug upstairs. "When the Porsche Design people came, they stuffed our display cases full with all sorts of products. As soon as they left I had half of it removed and I'm still not happy - There needs to be fewer products" he said, looking around for offending goods. "This place will look different in six months time. I'm not sure how yet, but it will." While it remains a test bed, Porsche's head of retail network development, Barbara Voller, says the format will be carried into other markets in an approach tailor-made for the area. Beirut, a fashionable city home to many of the Middle East's wealthy, and Guangzhou are two, as is San Francisco. 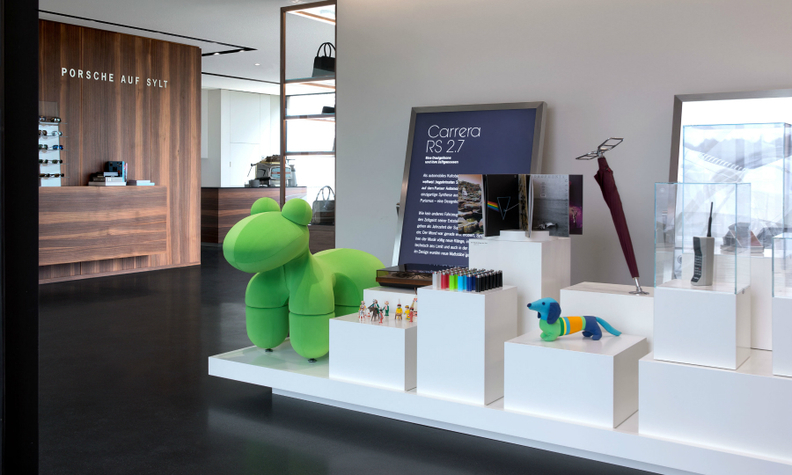 After traveling to Porsche Centers in Qatar or Hyundai brand shops in Korea, where kid-friendly corners were set up, Voller is already thinking about how best to entice and entertain children at lounges such as "Porsche auf Sylt." "Maybe a video game console with a racing game such as Need For Speed, where you can unlock a special Porsche," she suggested. Porsche at Sylt from Porsche AG on Vimeo.